Unfortunately, I have written many times, too many times, about hatred and the many clever guises it assumes -- racism, prejudice, misogyny, anti-Semitism. You name it or call it what you want, but they all fall under the same evil umbrella. 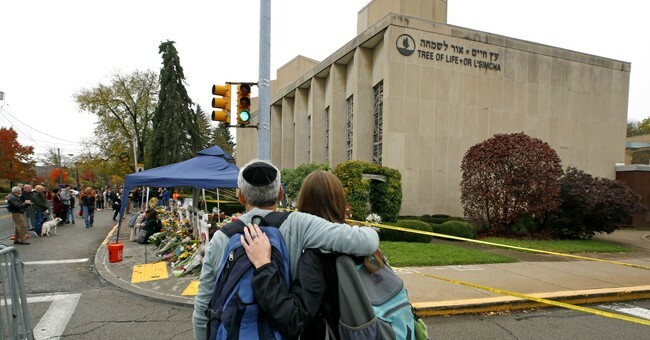 As one rabbi so eloquently stated on CNN in the aftermath of the synagogue tragedy, at their core, these actions and behaviors are all rooted in hatred, nothing more and nothing less. They don't know creed, color or political identification. These vessels of demonism have one goal and that is to maim and destroy, unapologetically. Never mind the man that is Donald Trump, the current President of the United States. How about the presidential office? What about the institution that is the presidency of the United States? Do we as Americans have such disdain for the office itself that some would go out of their way to be disrespectful and inhospitable -- even in a time of extreme tragedy and heartache? What comfort does that bring? Who does that impress? We all know the answer: no one. Yet we know the mainstream media is all too eager to point cameras into these emotionally charged scenes for a morsel of information that offers nothing more than another superficial layer of criticism for the president. Finally, when will our society and its leaders choose mercy and grace over revenge and this obsessive need to "get even?" There is no question the President has said and done many things that have not advanced these basic principles of leadership that are the foundation of this great nation. As a leader, he should show humility and own his mistakes. The rhetoric following the Tree of Life tragedy has done nothing to advance the cause of comity. And that's my point: We cannot begin to help heal a land so desperately in need of healing until this country has leaders who, in times of tragedy, can set aside their petty political differences and lead by example in the name of a higher, greater calling. That's where we should train our thoughts and meditations -- on becoming better people, individually, so that we can become a better society, together.